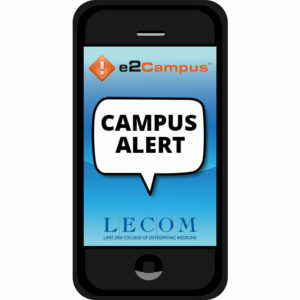 LECOM has adopted e2Campus, a notification system that enables the school to send urgent news to your cell phone and via other methods. After students and employees sign up for the service, the school can text cell phones with timely information about emergencies, class cancelations or critical campus reminders. Click on phone to register now for e2Campus alerts. LECOM is making the service available to all current students, faculty and staff. Now, e2Campus can notify everyone instantly regarding any emergency or development on campus. Since cell phones have become the primary source of communication for students, the e2Campus system takes full advantage of the technology that students rely upon for instant information. All first year students are provided with email access to e2Campus upon matriculation. They are encouraged to log on with the information provided at orientation to add cell phone numbers to their account to be notified via text message of Campus emergencies, etc. Campus police are urging the entire campus community to register. Although e2Campus is an excellent system that can notify the entire campus within minutes, it only works if you take a minute to register yourself in the system. There is no cost to register with the e2Campus notification system. The notification system will be used to communicate important information during any potential emergency, such as a snow delay or closing, homeland security advisory, weather warning, gas leak, fire, crime watch, power failure, boil-water advisory, parking lot closure or other emergency event. To learn more or to sign up, click on the phone on this page. Depending on personal cell phone plans, there may be a nominal fee from your carrier to receive text messages, but there is no charge from the school to use the service.